Yesterday I got back from my latest trip to South Africa and Botswana, where I had a number of great elephant sightings. One memorable morning included a herd of 40 elephants who spent time carefully touching and smelling the bones of a dead elephant cow (more about that coming soon). Using the gray to paint the negative shapes around the elephant made them really stand out, and I finished off the piece with same mixture but with more crimson added to create a lovely subtle brown. I used my rigger brush to pull some of this brown out in the foreground as sticks, and also used it to emphasize some of the features on the main elephant. I think another reason for my muted palette is the severe drought which has affected most of southern Africa, leaving bare, parched earth devoid of vegetation. Many grazers and browsers are struggling from lack of food, and their poor condition leads to fairly easy pickings for many predators. Elephants are able to strip trees of their bark, dig up tree roots and even eat unpalatable-looking sticks and thorns, but their search for food can be hugely destructive. I hope this year’s rains will be slow, steady and long lasting, so the vegetation can recover. On my next visit I hope to be painting with more greens – which also look great with grays and yellows. Until next time…enjoy the elephants. This entry was posted in African Wildlife, Blog Posts, Elephants, Field Sketches, For Artists, Watercolors and tagged Alison Nicholls, Botswana, elephant, elephant sketch in watercolor, field sketch on September 20, 2016 by Alison. Do You Know These Hamerkop Facts? First, the obvious – Hamerkop means ‘hammer-head’ in Africaans. Don’t think I need to explain why! Second – the Hamerkop is only a medium sized bird, but it builds huge nests, often 6-8 feet across, made of thousands of sticks usually wedged between the branches of a large tree. Third – the Hamerkop nest has walls, a roof and a tunnel, plastered with mud, that leads to a sheltered inner chamber where the female lays her eggs. There you have it – the weird and wonderful Hamerkop. The photos are by my husband, Nigel Nicholls ©2015. I particularly love the trailing feet in the water! This entry was posted in African Wildlife, Blog Posts and tagged Alison Nicholls, Hamerkop, Nigel Nicholls, wildlife on August 4, 2016 by Alison. The deserts I usually frequent in Africa do contain a lot of thorny, spikey plants, and Namibia in particular does have some outlandishly beautiful flora, but recently I visited Arizona and was struck by the cacti. Not literally of course – I just thought I’d share some images! There was a mini heat-wave going on while I was there (117F during the day and nearly 100F at night) so I’m afraid I didn’t trek miles into the desert to find these. But despite that, I’m sure you’ll agree they are spectacular – especially as some of them are flowering! I’ll definitely be going back, preferably when its a little cooler! This entry was posted in Blog Posts and tagged Alison Nicholls on June 13, 2016 by Alison. Part II of an exhibition in images features the Opening Reception. The exhibition is Wildlife Art: Field to Studio at the Flinn Gallery in Greenwich, Connecticut, which features field work and studio work from 7 Signature members of the Society of Animal Artists. Each artist works in a different region of the world: Alison Nicholls (Africa); David Rankin (India); Karryl (Rocky Mountains); Carel Brest van Kempen (Central America); Kelly Singleton (Alaska); Sean Murtha (Long Island Sound) and Susan Fox (Mongolia). The exhibit is on display until May 4, 2016. Over 260 visitors attended the opening reception and the evening was a resounding success. But this was just the start of a busy weekend of events. Next time I will show you images from the Children Sketching Animals! Wildlife Art: Field to Studio is curated by Lillian Lum, Claudia Schipper & Alice Sherwood. It is on display until May 4 at the Flinn Gallery in Greenwich, Connecticut. This entry was posted in Acrylics, African Wildlife, Art Safaris, Big Cats, Blog Posts, Conservation, Exhibitions, Field Sketches, For Artists, Painted Dogs (African wild dogs), Watercolors and tagged Alison Nicholls, field sketch, Flinn Gallery, wildlife art on April 28, 2016 by Alison. Soon my paintings, including Zebra in Mopane, will be hanging in the Flinn Gallery in Greenwich, Connecticut. We have some great events scheduled around this exciting exhibition, so come and see the wildlife of Africa, Mongolia, Alaska, India, the Rocky Mountains, Central America and the Long Island Sound from the unique perspectives of a diverse group of artists. Here are the details you need to know! Children Sketching Animals: 11am-12pm. Sold Out. Artists Talk: Susan Fox (Mongolia), David Rankin (India) & Karryl (Rockies), 2-3pm. Artists Talk: Alison Nicholls, Susan Fox, David Rankin, Sean Murtha & Karryl, 6pm. The Explorers Club, 46 East 70th Street, New York City. Registration Required. Artists Talk: Alison Nicholls & Sean Murtha, 2-3pm. The exhibition runs from March 24 – May 4, 2016. The Flinn Gallery is located at 101 West Putnam Ave, Greenwich, CT 06830. Wildlife Art: Field to Studio is curated by Lillian Lum, Alice Sherwood & Claudia Schipper. Come and join me at one of our exciting exhibit events! 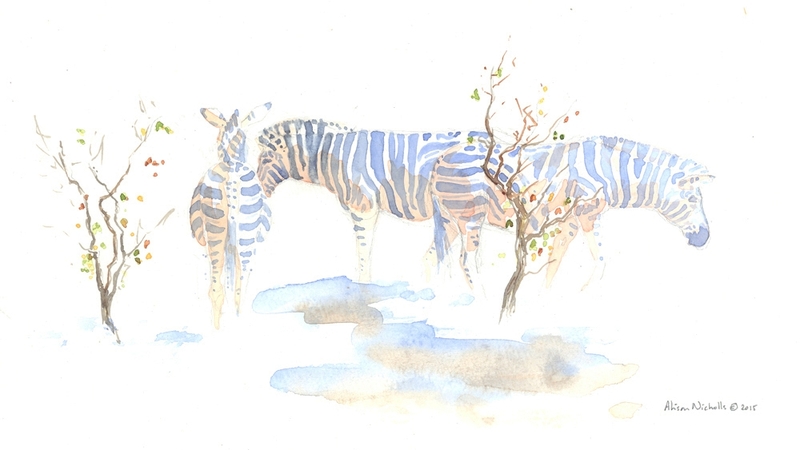 This entry was posted in Acrylics, African Wildlife, Big Cats, Blog Posts, Conservation, Exhibitions, Field Sketches, For Artists, Painted Dogs (African wild dogs), Watercolors and tagged African wildlife, African wildlife art, Alison Nicholls, Flinn Gallery, zebra painting on March 22, 2016 by Alison. Start the Weekend with Chittering Dogs! Start the weekend with chittering painted dogs! Join me to hear Dr Greg Rasmussen of the Painted Dog Research Trust talk about the unique, endangered and beautiful Painted Dog (African wild dog). Dr Rasmussen will talk about the years he has spent with painted dogs and the challenges facing them, particularly in Zimbabwe. Sitting around the campfire we listened to spotted hyenas, watched for elephants in the dark next to our tents, and heard more from Dr Rasmussen about life as a painted dog conservationist. It was an experience not to missed. And I urge you not to miss this opportunity to hear him speak about his life and work with painted dogs! So join me on Saturday (and you’ll also have a chance to win a limited edition field sketch of painted dogs from my last visit to southern Africa)! Lecture with Dr G Rasmussen of the Painted Dog Research Trust. When: Saturday Feb 20 at 6pm. What Else? Registration required. Click here. This entry was posted in African Wildlife, Blog Posts, Conservation, Painted Dogs (African wild dogs) and tagged African wild dog, Alison Nicholls, painted dog, Painted Dog Research Trust, PDRT, Rasmussen, wolf conservation center on February 19, 2016 by Alison. Spot my New Cheetah Painting! I’d like to show you my new cheetah painting, Strides, but I can’t – not yet! It will be revealed in late March when it hangs in the Flinn Gallery in Greenwich, CT, as part of the exhibition Wildlife Art: Field to Studio. See the full painting in March in the Flinn Gallery, Greenwich, CT. In the meantime, enjoy the preview! Artists’ Talk: April 2, 2-3pm. The Explorers Club Lecture, New York City. April 4, 6pm. Registration is required. This entry was posted in Acrylics, African Wildlife, Big Cats, Blog Posts, Exhibitions, Field Sketches, For Artists, Workshops and tagged acrylic cheetah, African cheetah art, Alison Nicholls, cheetah, cheetah painting, Flinn Gallery, wildlife art exhibition on February 12, 2016 by Alison. Playtime is based on my recent sketches and memories of painted dogs in Botswana playing around a tall clump of buffalo grass. So where is the grass, I hear you asking? Well the composition did originally contain the grass, but I removed it because I felt that the obvious playful energy of the 2 dogs was the real essence of the painting. You can see from their raised tails, raised ears and general body language that they are ready to run and chase each other, they are just waiting to see who will make the first move. The playful nature of painted dogs (African wild dogs) is just one of the reasons they are so wonderful to watch. They exude a real joy in being part of a pack, having close companions, and in celebrating their successful hunts. My choice of colors – magenta and cyan – reflect the joyful, energetic nature of the piece and the layered washes of color create distance between the 2 dogs (so I was able to remove the grass from the composition!). Playtime was very loosely based on some of my recent field sketches, including this piece, created in Zimbabwe when I spent time with Dr Greg Rasmussen of the Painted Dog Research Trust in Mana Pools. Playtime and several more of my new paintings & sketches will be on display in Wildlife Art: Field to Studio, an exhibition at the Flinn Gallery in Greenwich, Connecticut. The exhibit features work by 7 artists, several of whom are personal friends of mine, and all of whom are Signature members of the Society of Animal Artists. We work in a wide variety of media – watercolor, acrylic, oil, digital media & sculpture; in a variety of styles – contemporary, whimsical & realistic; and we undertake our field work in different parts of the world – Africa, Mongolia, Alaska, the Rocky Mountains, India, Central America & the Long Island Sound. It promises to be an exciting exhibition and at least 5 of the artists will be present for the opening reception and weekend programs for children and adults. My fellow artists and exhibitors are Susan Fox, Sean Murtha, David Rankin, Karryl, Kelly Singleton and Carel Brest van Kempen. The exhibition was curated by Lillian Lum, Alice Sherwood and Claudia Schipper. Please join me for the Opening Reception or one of the programs associated with the exhibition. Artists Talks: April 2, 2-3pm. This entry was posted in Acrylics, African Wildlife, Blog Posts, Exhibitions, Field Sketches, For Artists, Painted Dogs (African wild dogs), Watercolors and tagged African wild dog, Alison Nicholls, canid art, field sketches, Flinn Gallery, painted dog on February 4, 2016 by Alison. Part 2: Fashionable Color Palettes – Artistic Smart Move or Sellout? An Artist’s Opinion. Color is a very, very important part of my art and my color choices are carefully considered. I often use color to indicate a time of day – reds and oranges for the heat of midday; blues and purples for dusk. I also use combinations of colors to suggest a mood – limiting my palette of colors to create a tranquil feel for a painting. Given the way I think carefully about my use of color, you might expect me to be completely averse to artists using seasonal color palettes, like Pantone’s Fashion Color Report, but in fact, I’m not. The 1st time I realized I had unknowingly been influenced in this way was in Moremi Game Reserve where I spent a couple of hours sketching a herd of impala, standing stationary for minutes in uncomfortable positions, afraid to move an inch in case they saw me. I ended up with a nice little pencil sketch, came back to camp and decided to use a deep red-brown watercolor to complete it. When I’d finished, a friend commented on this being an unusual color choice for me, and I agreed. Only several minutes later did it occur to us that this was the exact color of the huge flowers of the sausage tree above our heads! This week I had another example. I started a painting using a dusky pink- brown and was considering where to go with the next wash of color. I headed downstairs to make a cup of tea and decided that a vase of roses on the fireplace should really be thrown out. The roses never opened or dropped their petals, they just seemed to have dried, but they were still beautiful, so I decided to keep them in my studio for a while, thinking that the muted colors would make a lovely color scheme for a painting. As I walked into my studio with the vase of flowers I realized my current painting was already the exact shade of pinky brown as the roses! My point is that you will almost inevitably be influenced, consciously or unconsciously, by everything around you. I may not decide to paint my next painting in Peach Echo or Serenity just because they are part of Pantone’s Spring 2016 Color Report but if these colors start appearing in clothing and all over the internet in all kinds of products, I may unwittingly find them sneaking into my art. But maybe that is because these are fairly natural color choices for me anyway. Should the fall colors include lots of metallic grays and greens, it is unlikely that you’ll be seeing these in my Art Inspired By Africa! This entry was posted in Acrylics, Blog Posts, For Artists, Watercolors and tagged Alison Nicholls, art, color palette, pantone, peach echo, serenity on January 21, 2016 by Alison. From behind, an elephant can appear to be just a very large, fairly indistinct, object because most of the details – trunk, ears, tusks etc – are at the front end of the elephant. To indicate that this is a sketch of a bull elephant, I needed to include just a glimpse of the trunk, tusk and ears, but this was a difficult angle to sketch, because the elephant constantly lowered and raised his trunk to drink. As I began the sketch I was hoping he was planning to drink for at least a couple of minutes, so I could finish the sketch. Luckily for me, he obliged. I used the bold color scheme to emphasize the bulk of the bull elephant by first painting around him, then adding touches of color on the elephant to highlight the important details of his tail, spine, trunk and tusk. I think the combination was very successful! This Original Field Sketch is Sold, but Limited Edition Giclées are also available, priced at US$120 each. Only 10 copies are available, printed using archival inks on watercolor paper, 14×11″, all signed and numbered by me. Tomorrow’s sketch is of a 2 cheetahs preparing for a hunt.. This entry was posted in African Wildlife, Blog Posts, Elephants, Field Sketches, For Artists, Watercolors and tagged #africanwildlifesketch, African field sketch, Alison Nicholls, art inspired by africa, elephant, elephant sketch in watercolor, Zimbabwe on November 13, 2015 by Alison. It was incredibly windy on the morning I saw these Carmine Bee-eaters nesting on a flat riverbank in Linyanti. It was so windy that I couldn’t even begin to sketch them, so instead I concentrated on memorizing their stunning colors and trying to figure out if I could even create these colors from the very limited palette I have available in my field sketch kit. After a few minutes we moved away and stopped for morning tea and even though the wind continued to blow, I got out my paints and huddled down next to the vehicle to create this sketch. Although it may be far less dramatic and detailed than many of my other field sketches, the fact that I managed to create this sketch at all (and get close to the stunning colors of these amazing birds) makes this quite an achievement in my eyes! This Original Field Sketch is watercolor and pencil on watercolor paper, 11×14″ and priced at US$300. Tomorrow’s sketch is of a bull elephant drinking. This entry was posted in African Wildlife, Blog Posts, Field Sketches, For Artists, Watercolors and tagged #africanwildlifesketch, African field sketch, Alison Nicholls, carmine bee eater, field sketch on November 12, 2015 by Alison. Lions, being large predators, are able to sleep mostly where they like (usually a shady spot) and for as long as they like (usually all day). They may be disturbed by elephants or buffalo, but most things don’t bother them. So they make for great sketch subjects. And this lioness had chosen a scenic spot, with mokolane palms in the background. Perfect! 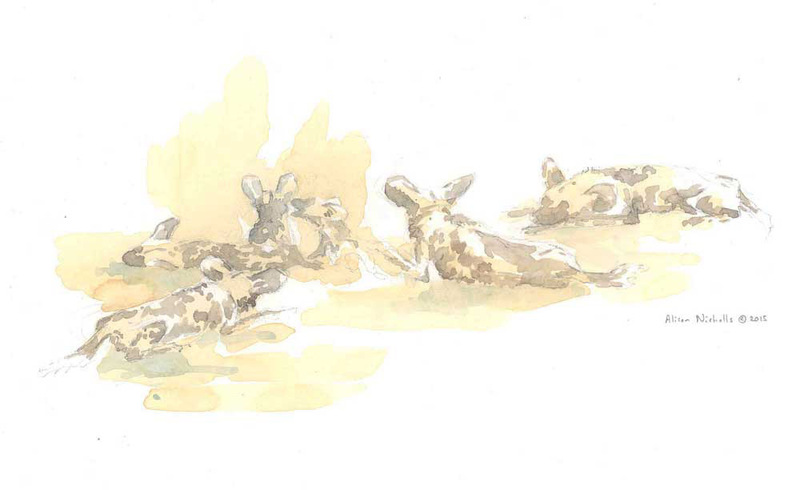 Tomorrow’s sketch is of painted dogs (African wild dogs) playing after a successful hunt. 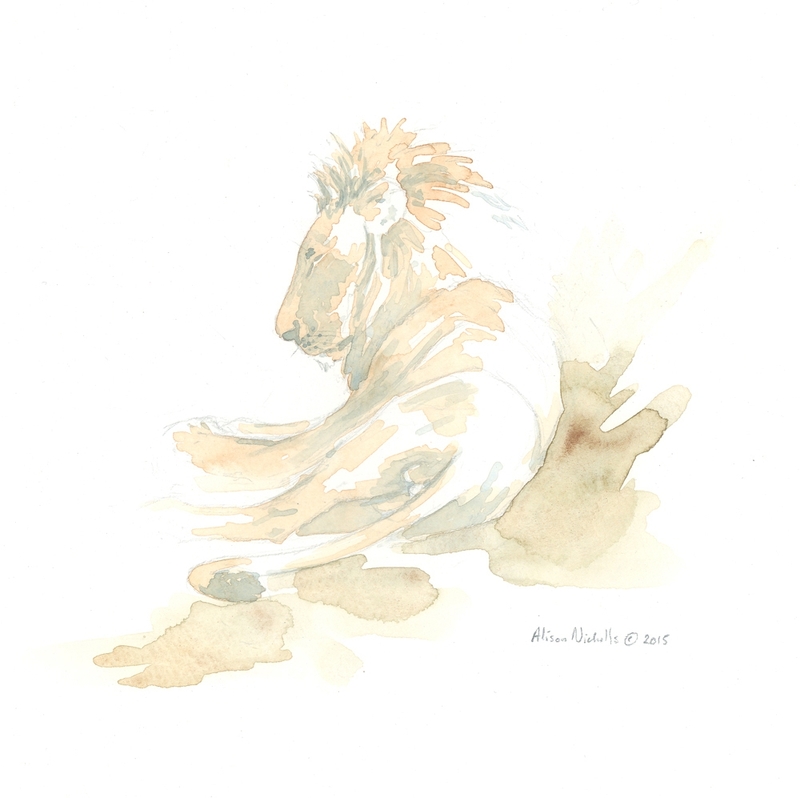 This entry was posted in African Wildlife, Big Cats, Blog Posts, Field Sketches, For Artists, Watercolors and tagged African field sketch, Alison Nicholls, Botswana lion sketch, lioness sketch, lioness watercolor on November 10, 2015 by Alison. These painted dog pups (African wild dogs) were sketched in Botswana. They were nearly 4 months old, beautifully colored (not actually purple!) and full of life. Everywhere I looked were pups running, leaping fallen logs, falling off logs, chasing each other and then cautiously approaching the vehicle in a crowd of long legs and huge ears. Soon after, they all collapsed in heaps under bushes and trees. That’s when I was able to create this sketch. I added the watercolor back at camp, which is where my artistic license crept in with the coloring! This Original Field Sketch is watercolor and pencil on watercolor paper, 11×14″, and priced at US$300. Limited Edition Giclées are also available, priced at US$120 each. Only 10 copies are available, printed using archival inks on watercolor paper, 11×14″, all signed and numbered by me. Tomorrow’s sketch is of another sleeping predator – a male lion. This entry was posted in African Wildlife, Blog Posts, Field Sketches, For Artists, Painted Dogs (African wild dogs), Watercolors and tagged African wild dog, African wildlife art, Alison Nicholls, painted dog, painted dog art, watercolor field sketch on November 8, 2015 by Alison. I often visit southern Africa in the dry season and over the last few years I have seen zebra herds in mopane scrub, but never managed to sketch them. Mopane can be beautiful trees, but in many areas, due to the large numbers of elephants, they are stunted and twisted, pruned to a convenient 6 or 7 foot height by the pachyderms! In the dry season, a few vibrant green leaves appear but they sit amidst the browns, oranges and reds of the old leaves. It is a beautiful combination, especially when a herd of boldly striped zebra wander through. Finally, this year, I managed to get the sketch down on paper and it may very well become a studio painting too! 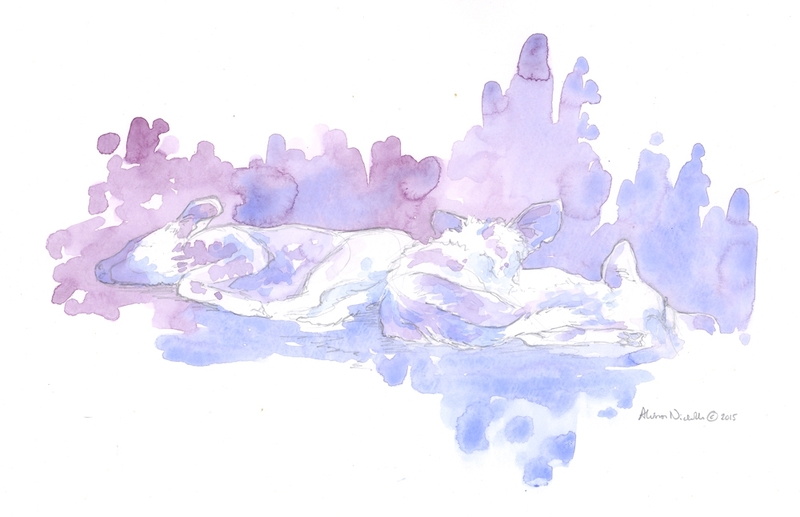 Tomorrow’s sketch is of sleeping painted dogs! This entry was posted in African Wildlife, Blog Posts, Field Sketches, For Artists, Watercolors and tagged African wildlife, Alison Nicholls, zebra, zebra sketch, zebra watercolor, zebra watercolour on November 7, 2015 by Alison. When I sketch giraffes I realize just how strangely they are put together. Whereas circles form the basis of most of my animal sketches, with giraffes there seem to be more triangles involved. Their necks look ridiculously thin from some angles, their knees and feet are huge when seen up close, they have an amazingly long tongue and big males often have faces covered in lumps. Somehow, despite all this, they manage to be one of the most elegant animals in the African bush! This Original Field Sketch was sold yesterday, but Limited Edition Giclées are also available, priced at US$120 each. Only 10 copies are available, printed using archival inks on watercolor paper, 11×14″, all signed and numbered by me. Tomorrow’s sketch is of a zebra in mopane scrub. 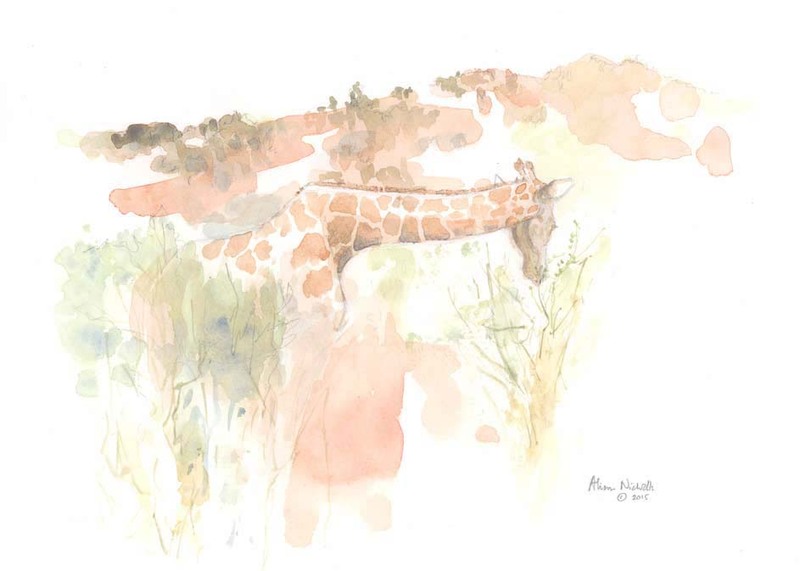 This entry was posted in African Wildlife, Blog Posts, Field Sketches, For Artists, Watercolors and tagged African wildlife art, Alison Nicholls, field sketch, giraffe, South Africa on November 6, 2015 by Alison. I have hardly any sketches of hippos, because you normally just see their ears, eyes and nostrils protruding above the water. 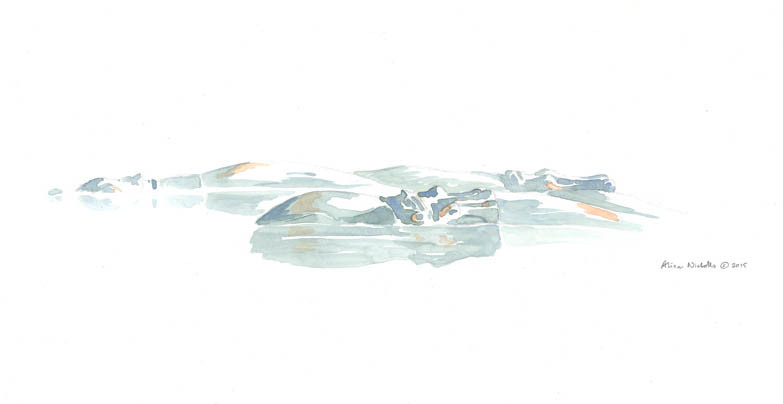 This pod were partially submerged, but the way they were lying gave me just enough to sketch. It is a very simple piece, but I think its simplicity makes it effective. Tomorrow’s sketch is of a browsing giraffe. 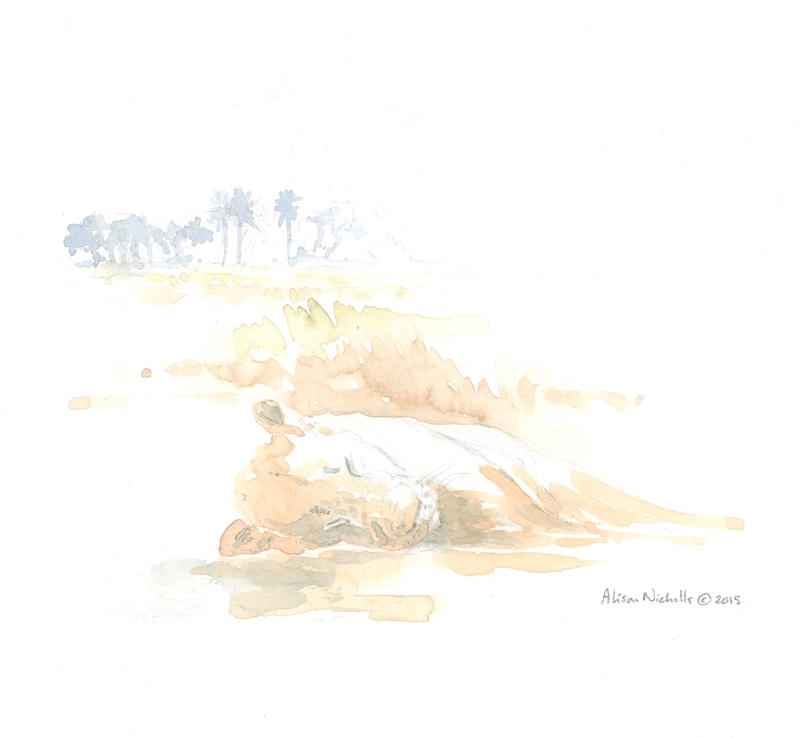 This entry was posted in African Wildlife, Blog Posts, Field Sketches, For Artists, Watercolors and tagged African wildlife, African wildlife art, Alison Nicholls, field sketch, hippo, watercolor sketch on November 5, 2015 by Alison. Painted dogs (African wild dogs) are one of the most intriguing of species, and one of the most difficult sketch subjects in the African bush. During the day they tend to lie in the shade, and they have such a lean build that when they lie flat out, they look pretty flat! Once they have finished napping, the pack becomes alive with activity – stretching, yawning, greeting each other, playing, then they are off on a hunt and virtually impossible to keep up with. However, during my September trip to southern Africa, I was lucky enough to see 4 different painted dog packs and spend considerable amounts of time with them. This sketch was created after the pack had hunted, killed and eaten an impala. As they rested for a moment nearby, I got to work! This Original Field Sketch is sold, and this painted dog pack is currently trotting off to their new home in North Carolina! However, Limited Edition Giclées are also available, priced at US$120 each. Only 10 copies are available, printed using archival inks on watercolor paper, 11×14″, all signed and numbered by me. Tomorrow’s sketch is of a pod of hippos. This entry was posted in African Wildlife, Blog Posts, Field Sketches, For Artists, Painted Dogs (African wild dogs), Watercolors and tagged African field sketch, African wild dog, Alison Nicholls, Botswana dogs, painted dog, painted dog artist on November 4, 2015 by Alison.